Quick overview The Antec KÜHLER H2O 650 delivers high-performance liquid cooling for your CPU in a quick, easy-to-install package. Unlike traditional liquid cooling systems, this self-contained unit comes prefilled and requires no maintenance. The extra large pump circulates coolant through optimized water channels, while easy-bend flexible tubing allows the KÜHLER H2O 650 to be installed in nearly any orientation. 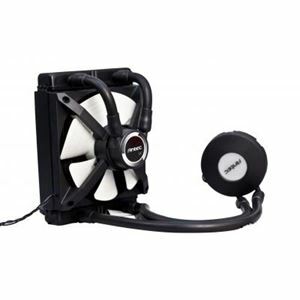 In addition to easy installation, a powerful PWM fan pushes air through directional blades and channels it through the radiator for optimal cooling. Included in the box is an air duct that reduces static pressure which in turn, allows air to flow out of the case efficiently. Lastly, integrated firmware automatically adjusts fan speed and changes the RGB LED based on temperature. Engineered for maximum performance, the Antec KÜHLER H2O 650 delivers liquid cooling performance at an air cooling price.